Prototype: 2 different design electric locomotives. 1 Swedish State Railways (SJ) class Da with the road number 903. 1 Swiss Federal Railways (SBB) class Ce 6/8 III "Crocodile" freight locomotive with the road number 14305. Both locomotives have a fir green basic paint scheme. The locomotives look as they currently do in 2015. Model: Reissue of two Märklin classics from the Fifties. Swedish Da: This model is based on Märklin item number 3019. It has an mfx digital decoder. It also has controlled propulsion. 3 axles powered. Traction tires. The locomotive has triple headlights that change over with the direction of travel. They will work in conventional operation and can be controlled digitally. The locomotive body and frame are constructed of metal. The Märklin name and the item number are in relief on the locomotive body. Relex couplers are present on both ends of the locomotive. Length over the buffers 14.7 cm / 5-3/4". Swiss Crocodile: This model is based on Märklin item number 3015. It has an mfx digital decoder. It also has controlled propulsion and a large centrally mounted motor. 6 axles and 2 jackshafts powered. Traction tires. The locomotive has an articulated frame to negotiate curves well. It also features heavy metal construction with a 3-part metal body and hoods that can swing from side to side. The locomotive has triple headlights that change over with the direction of travel. They will work in conventional operation, and can be controlled digitally. The Märklin name and the item number are in relief on the locomotive's center part. Relex couplers are present on both ends of the locomotive. Length over the buffers 26.6 cm / 10-1/2". Both locomotives are packaged individually with a colored representation of each locomotive on its respective packaging. This is based on the historic packaging for the models in question. There is also a master package in a style befitting these models. The Swedish Da meets the Swiss Crocodile for the anniversary of 100 years of the first Swedish State Railways' (SJ) electrified rail line in 1915. Reissue of two Märklin classics from the Fifties. Both locomotives include an mfx decoder. Worldwide limited to 3,000 sets. Consecutively numbered certificate of authenticity. 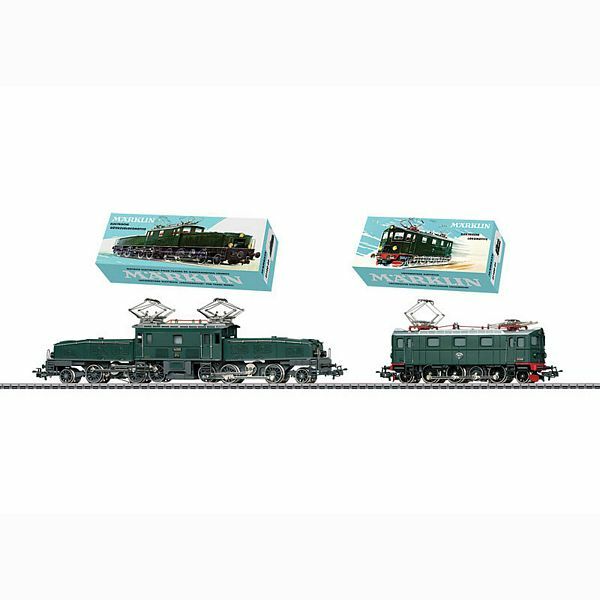 This exclusive double locomotive set is being produced in a one-time series on the occasion of the Swedish State Railways' (SJ) first electrified rail line 100 years ago and the historic trip of a Swiss Crocodile to Sweden to the meeting there with a Swedish class Da. Delivery is planned for the 2nd quarter of 2016.